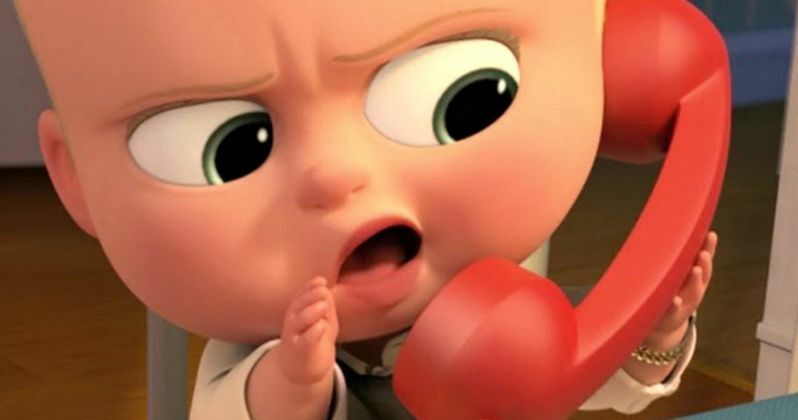 DreamWorks Animation and 20th Century Fox have debuted a brand new trailer for Boss Baby, a hilariously universal story about how a new baby's arrival impacts a family, told from the point of view of a delightfully unreliable narrator, a wildly imaginative 7 year old named Tim. Not only do we get a fresh look at this very funny comedy for all-ages, we also get a special introduction from Alec Baldwin himself. He says this to the paying audience. "I'm Alec Baldwin, and you are seconds away from seeing a sneak peek of Dreamworks' new animated film, The Boss Baby. I'm so excited for you, really. I've got the whole butterfly in the tummy thing going on." The Boss Baby hits theaters everywhere on March 31, 2017! The animated family comedy will arrive in both traditional movie theaters and in 3D. Tom McGrath directs the movie from a script written by Michael McCullers. The DreamWorks Animation project is actually based on the very popular and award-winning picture book by Marla Frazee, whose pages come to life in this latest video. Ramsey Ann Naito produces Boss Baby. Alec Baldwin takes on the title character. He is joined by a fine ensemble of voice acting talent. At his side for these hilariously fun antics will be none other than Steve Buscemi, taking on a rare family film for a change. Also lending their vox talents are Jimmy Kimmel, Lisa Kudrow, and Miles Bakshi. DreamWorks Animation and the director of Madagascar invite you to meet a most unusual baby. He wears a suit, speaks with the voice and wit of Alec Baldwin, and stars in the animated comedy, DreamWorks' The Boss Baby. The Boss Baby is a hilariously universal story about how a new baby can disrupt a family, especially when we view this world from a lower angle, as told by young Tim. With a sly, heart-filled message about the importance of family, DreamWorks' The Boss Baby is an authentic and broadly appealing original comedy for all ages. When the brother of this fast-talking briefcase-carrying baby embarks on a mission to win back the sole affection of his parents, he stumbles upon a secret plot by the CEO of Puppy Co. that threatens to destroy the balance of love in the world. And this brash baby executive masquerading as his new brother is at the center of it all. Now, they must come together as true brothers to stop the dastardly scheme, save their parents, restore order to the world, and prove that love is indeed an infinite force. Tom McGrath made his directorial debut with Madagascar in 2005, going on to direct that franchise's next two sequels. He also helmed the 2010 animated comedy Megamind featuring the voices of Will Ferrell and Brad Pitt. The Boss Baby is a born leader. Get a new look at this infant terrible in the full trailer courtesy of DreamWorks and 20th Century Fox. Then be sure to mark your calendar for this surefire hit. You don't want to miss one joke when it comes to the very funny Boss Baby!